IT WAS A WARM AND BREEZY MORNING when the CTFN facilitators arrived at La Solea Resort. Nathaniel Arong and his co-facilitators, Nicolo Nasol and Kriza Rule, made up the CTFN team for that day. Waiting for them were the QBE team, who are still shaking off their sleepiness. Some of them just got out from the office and went directly to the event. Not too long, it was then time to start the long day. Nathaniel took the lead and called for the still-sleepy participants, with such thundering vitality that the QBE participants jumped out of their chairs and went with him under the 9 o’clock sun. To break the ice of sleepiness, Nathaniel taught the QBE team a bit of his Tai Chi Mastery. He was perfect for this icebreaker since he indeed looked Chinese, or at least Korean. With a serious yet calm tone, he asked the QBE to follow after his choreography. Breathe in, slowly, then breathe out, accompanied with specific movements. Then Nathaniel delivered the punchline that made the QBE team burst in laughter under the morning sun. Blasted also with some Ed Sheeran upbeat music from the speakers, care of Nicolo, the assigned soundman. Kriza assisted with the documentation. Once it was clear that the QBE team’s awake already, things were set in motion. 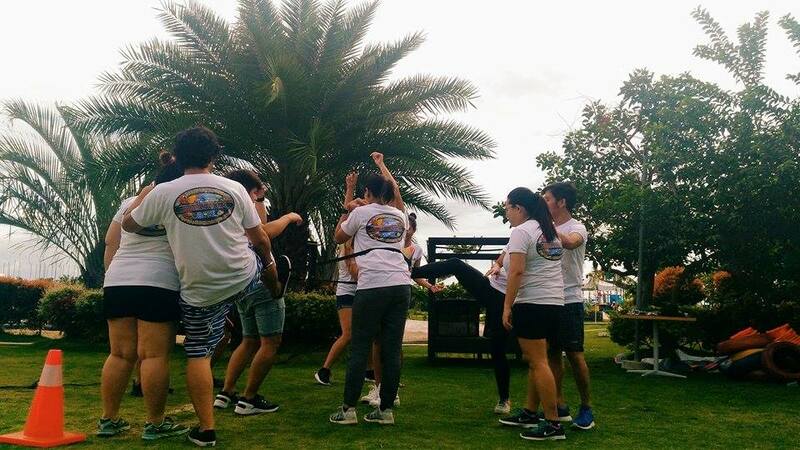 What followed was a series of activities, which were aimed at creating more familiarity with colleagues, camaraderie, sensitivity, and team dynamics awareness. All these toward lunchtime. After the World Records, Team Cheer Presentation, and Helium Ring activities, there was enough time before lunch for Nathaniel to discuss Johari’s Window. Facilitated by Nicolo, the Helium Ring activity did well to challenge the QBE team, which were made into 3 subgroups. There were shouting and yelling from all corners of the team during the activity. All the teams weren’t quite successful, and this was great material for the group processing and lecture. Nathaniel discussed to the QBE team the Johari’s Window and Team Dynamics. 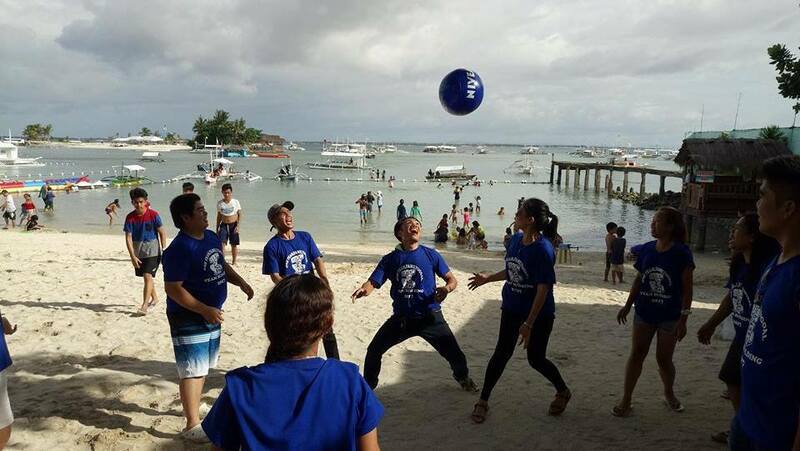 The points brought up during the lecture proved evident during the afternoon activities. Nathaniel gave a brief icebreaker to prepare the QBE team for the carousel of activities, which were Moon Ball, Inside Out, and then Hover Board. The stations of were spread around the resort. The sun beat down happily on everyone and made it a challenge to find a good-enough shade from the heat. But luckily, the winds were strong and cold that sunny afternoon, which provided brief respite during the activities. The subgroups processing was surprisingly in depth, taking into account what they had learned from the morning’s activities and discussion. The QBE team mentioned about listening and not talking at the same time and knowing each other’s strengths and weaknesses. They also talked about how they should move as one team, one step at a time. After a 15-minute water break, Nathaniel gathered the QBE team to form a circle and facilitated a group massage. Then he discussed with the group what happened throughout the day, what they had learned. Then he narrated about the power of touch and connection and that that also extended to the environment. He asked everyone to take off their shoes and slippers, and to just feel the grass with their tired feet and let the energy of the earth course through them. They QBE team found it so relaxing that it made them smile as if it was something they never did for a long time. Nathaniel soon closed the activity by encouraging everyone to connect with one another by way of hugs and gestures, no talking. The QBE team, happy and connected with each other, hugged one another and despite being encouraged not to speak, some team members said their thanks and appreciate. Many of them even approached us facilitators, said thank you, and shook our hands. Note: This article was written by Nicolo Nasol. 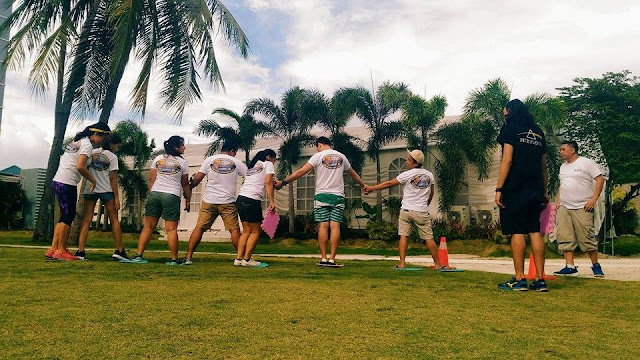 Nicolo was co-facilitator during the QBE team building program at Solea Resort in Cordova, Cebu, Philippines last 13 January 2018. Team building programs can be done at any time of the year, as long as the rain isn’t heavy enough to cause a flood or to cause damage to the training materials. In fact, a little rain holds a special charm. And even the all-too-sunny weather as well, especially when it’s experiential, outdoor, play-based facilitating we’re talking about. Even an unpleasant weather makes for memorable activities that create impact. Perhaps we can even say we learn more under more difficult conditions. 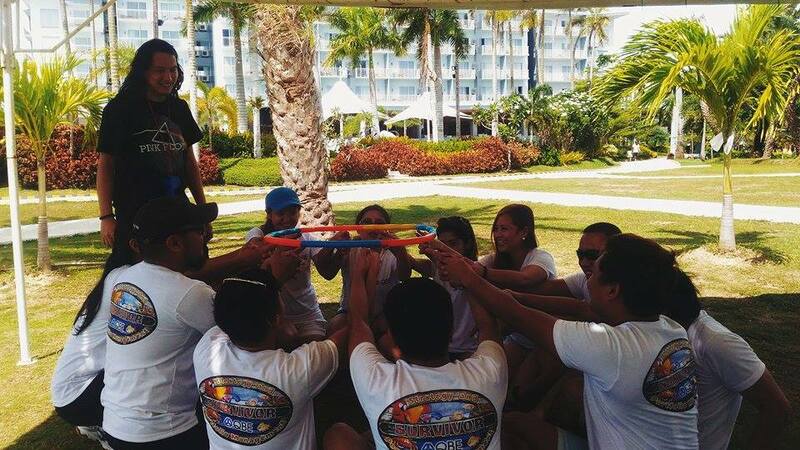 And in the case of conducting a team building program, it’s the facilitating that counts. Good facilitating is good facilitating, regardless of anything. ICE MAN – Cebu Cube Ice Corporation sent us an inquiry. With the target date less than a week away, our CTFN facilitators worked on it right away. 1) Crafting a training module, 2) Sending the proposal, 3) Preparing the logistics and arranging the venue. Then it was all done in a day or two. 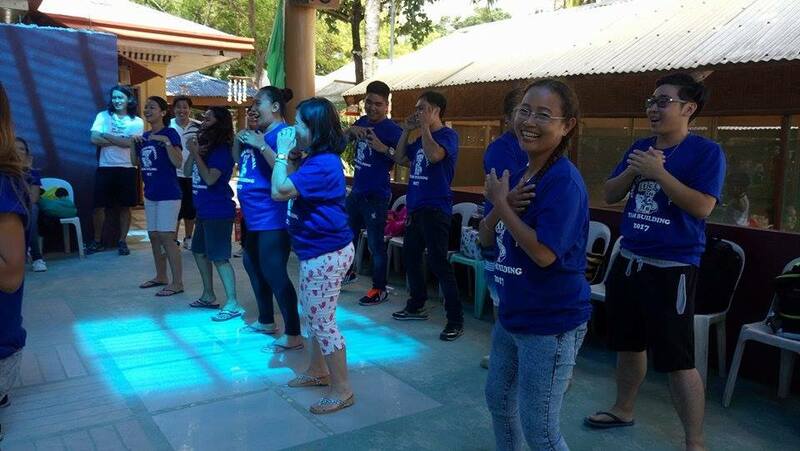 Despite the short notice (less than 3 days to prepare) the program pushed through on 26 November 2017 at Karancho Beach Resort, Lapulapu City, Cebu. Over 40 employees from ICE MAN attended. It was a hot yet easy Sunday morning for the ICE MAN employees. They seemed more than ready for the challenges, bringing in with them lots of chill and laughter. 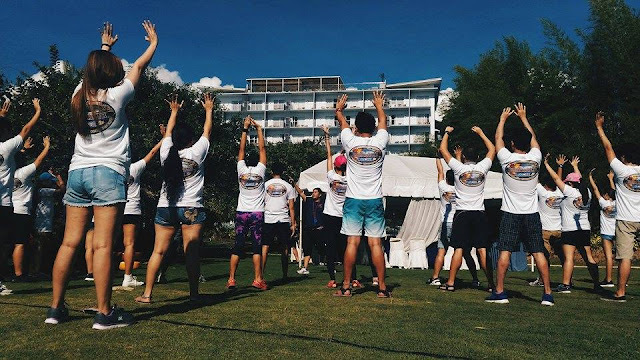 To kick off the series of activities, Nathaniel John Arong fired up the ICE MEN with icebreakers, which were also getting to know activities. Jump In-Out, World Records, Animal Sounds, and Team Cheer Presentations. Then the ICE MEN were grouped into three cool teams. Co-facilitating were Tiffany Manabat and Nicolo Nasol. The day went on slowly for the ICE MEN, filled in with team dynamic activities, processing and debrief, and short lectures (Tuckman’s Team Development Stages and Barriers of Communication). Helium Ring, Traffic Jam ,and Moon Ball! All of these activities were great challenges to the ICE MEN. But they have done quite well. One team solved the traffic jam in under 10 minutes. Another team managed a hundred moon ball taps in 3 or 4 minutes. After each activity, an in-depth processing of experiences followed, which brought out dozens of insights from the groups. Feel the Earth! Go Barefoot! Bear the Fruit! Preceding the climactic activity, we facilitated a one-two-three everybody up activity right there in the sand. It was therapeutic. The faces of the ICE MEN showed their delight at stepping barefoot right into the hot sand. Indeed, it felt soothing to the nerve endings of one’s feet. Afterward, lead facilitator Nathaniel brought the long day to a beautiful close with an emotional climactic activity. It was all joyful hugs and tears in the end. You can have your team building event during the Christmas season! Why not? After all, Christmas can also be a good season for learning. In fact, traditionally, December is when people learn to share love—by way of gifts—with their family, friends, and also with their company. (In this case, CTFN does this by way of team building activities.) Besides, what bonds a group of people more than their shared love for their group? CTFN tailor specific training environments wherein our participants can feel their love for their team. So let us make December be a season of loving and learning! Note: This article was written by Nicolo Nasol. 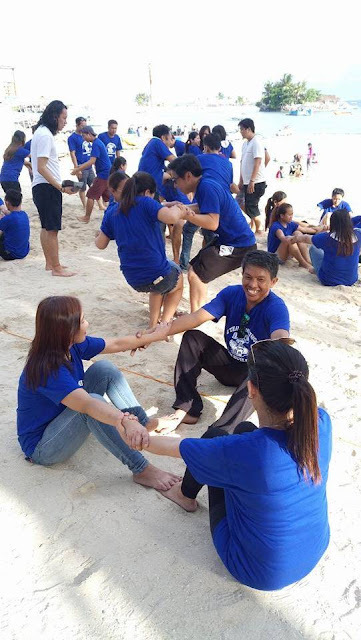 He was co-facilitator for the Cebu Cube Ice Corporation Team Building Event.